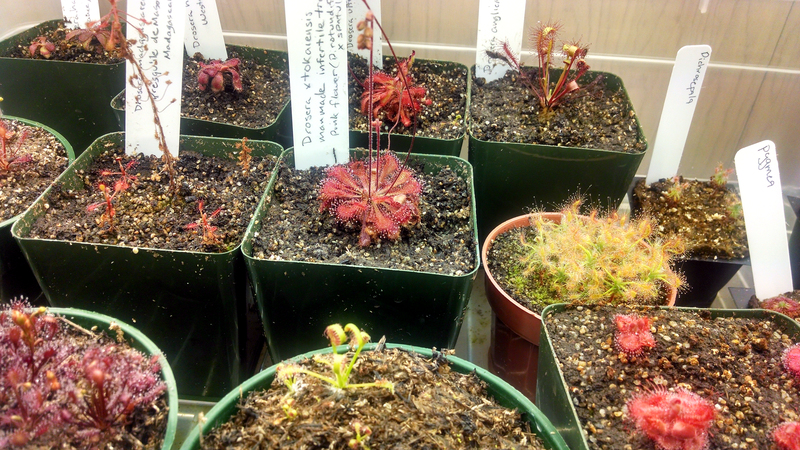 NASC auction acquisitions |Sundews Etc. 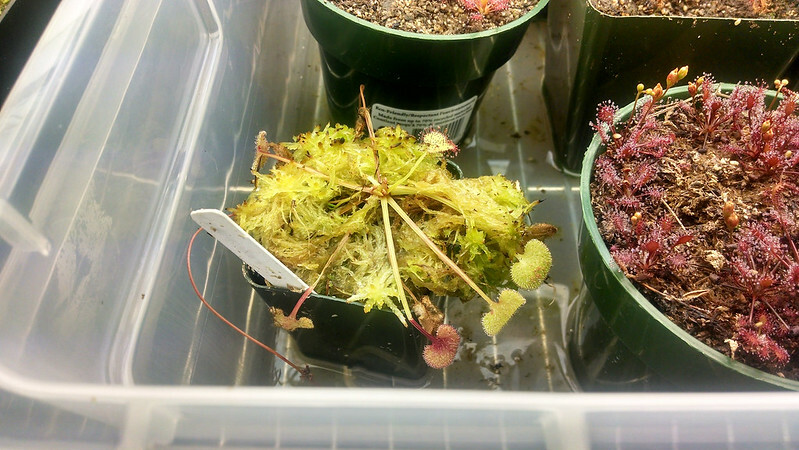 I've talked about a couple of the plants I won in the NASC auction – the pygmies and the Utricularia calcyfida – but there are several sundews that for one reason or another I haven't gotten around to discussing. In part I was letting them acclimate to my conditions (and making sure none croaked), and in part I was just too lazy. 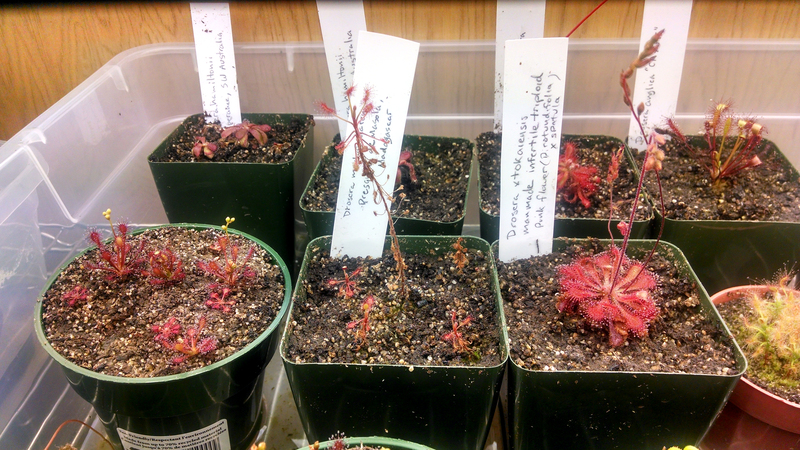 First up, here's Drosera prolifera. D. prolifera still looking a bit floppy. This was the last plant to arrive, and is still a bit straggly. It's put out one new leaf since being in my care, and I'm not too worried about it in the long term, though I do need to pot it up into something a little larger. It arrived with a couple of droopy flower stalks though, and – true to its name – has started a plantlet in the tray water on one of them. This bodes well for the future at least. One of the more uncommon plants I got is Drosera hamiltonii. 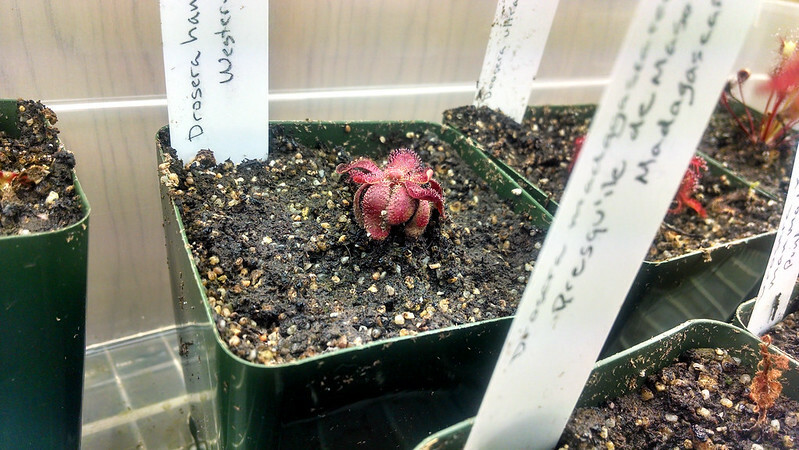 It's an Australian sundew which is sometimes a companion plant to Cephalotus follicularis. I ended up with plants with 2 different sets of location data ("Esperence, SW Australia", and "Western Australia"). The grower who put them up for bid wasn't 100% sure, but suspected they might be different clones, which would be important, since D. hamiltonii doesn't self-fertilize. 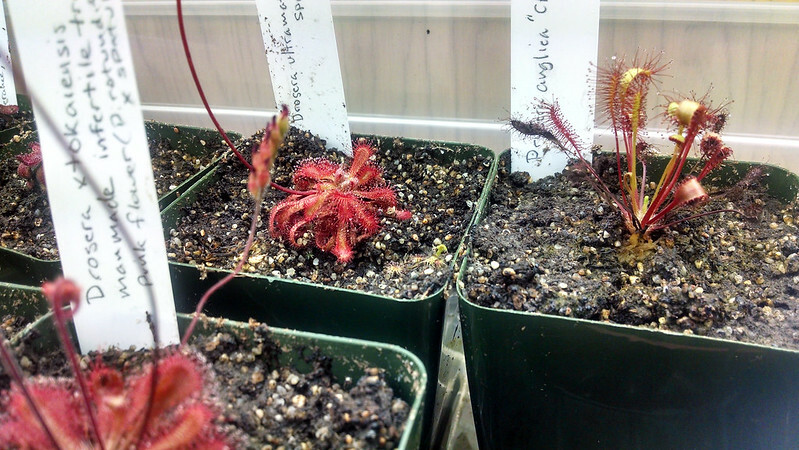 Drosera hamiltonii slowly getting comfortable. These guys have been the most reluctant to settle into my conditions. I'm not sure what exactly they want, but there's some dew production so maybe they're just a bit slower growing than the others. We'll find out going forward. These are very attractive when grown well, so I hope they settle in and start to grow. I may try transplanting a seedling or two into LFS to see if they like that better, but that'll be later on. I also got a couple of hybrids in the deal. 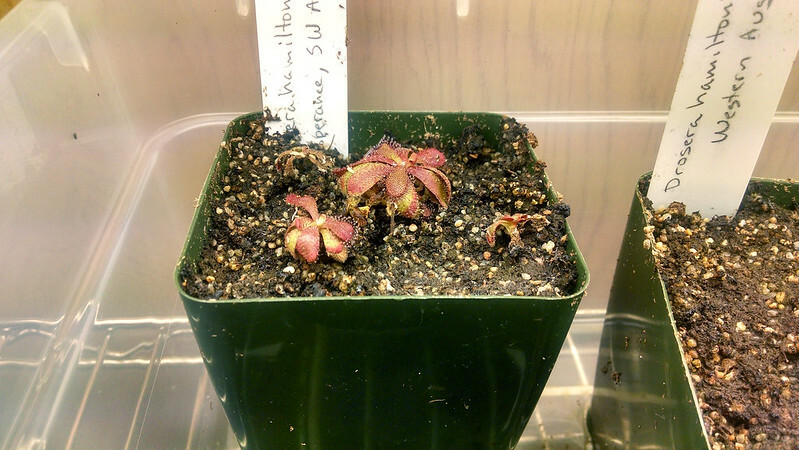 This is Drosera ultramafica x spatulata. The brilliant red of this hybrid really sold it for me. This plant has been flowering non-stop. Luckily the flowers are sterile. This is a man-made D. tokaiensis hybrid, which means it's sterile, unlike the naturally occurring D. spatulata x rotundifolia hybrid (more information here). It's also vigorous as hell – it looks like it's been here for months, rather than weeks. One of the most exciting plants I won is Drosera anglica CA x HI. This plant is a result of careful breeding between the small, tropical, Hawai'ian form of D. anglica with a larger temperate form from California. The result is a large, vigorous, beautiful plant with no dormancy requirement. The elegant D. anglica CA x HI was the early favorite among my housemates. It's not looking its best, since it was fed 2 days before this picture, but when all the leaves are fresh it's very striking. Long, upright petioles and delicate oval laminae – what's not to love. 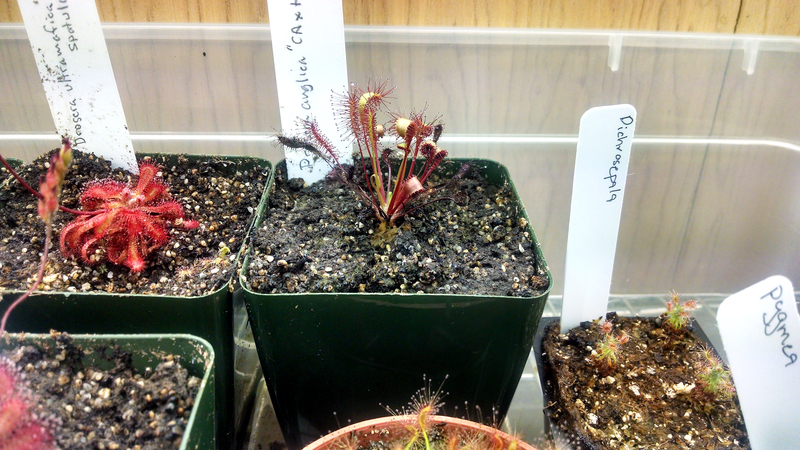 Finally, I got a plant I'd been looking for for months – Drosera madagascarensis. I just love how fragile the stalks end up looking. So delicate. 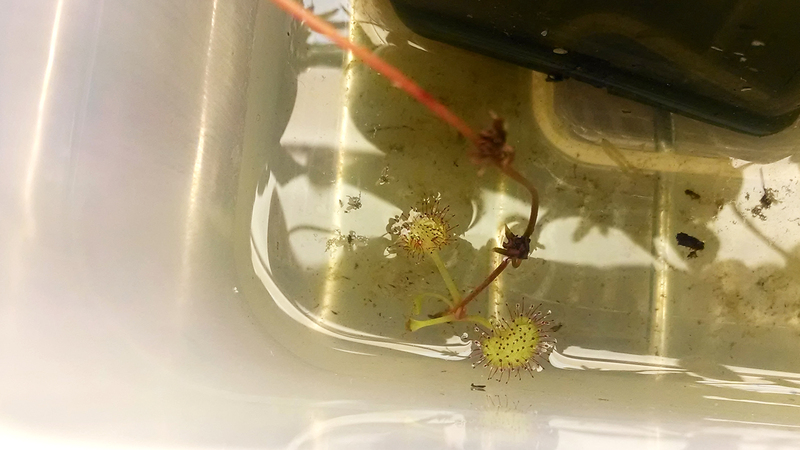 This whimsical, stem-forming South African sundew had been on my radar for some time, and I was super pleased to win one, especially one with location data (Presqu'ile de Masoala, Madagascar). I lost one of the seedlings, but I've still got 4 plants doing great. The NASC auction was a major event for me – I fleshed out my collection, and my money went to help preserve carnivorous plant habitat and genetic diversity. I intend to donate a lot more plants next year. Thanks for the heads-up Natch. I think my media might be a bit too dense for it then – I'll give it a few more weeks, and then see about repotting in a higher perlite mix.